Today is the birthday (1859) of Edmund Gustav Albrecht Husserl, a Moravian philosopher who established the school of phenomenology. In his early work, he developed critiques of logic, and in his mature work, he sought to develop a systematic foundational science based on what he called phenomenological reduction, and argued thatg that transcendental consciousness sets the limits of all possible knowledge. Husserl’s thought profoundly influenced the landscape of 20th-century philosophy, and he remains a notable figure in contemporary philosophy and beyond. I could get into some pretty deep waters here, but I will spare you too much philosophizing. Maybe you are like most people who don’t like to think too much about meaning, consciousness, and that sort of thing. You just like to get on with your life and let crazies, like me, worry about whether 2 or blue really exist. That’s fine. For me, trying to think as deeply as I can about all kinds of things is what makes me happy. I also like cooking and taking photos. There is room for it all. 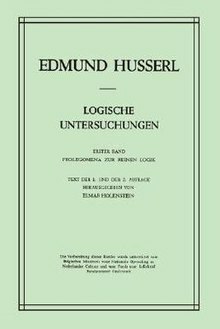 The fundamental point for me, that Husserl helps me with, is that what we can see and what we can think of is not all there is. I expect most people know this at some level. Great scientists of the past were often religious – sometimes deeply so – because they realized that science can only get you so far in uncovering what exists. Logic too. There is more to the world than our perceptions or our thinking can reveal. Buddhists know this. Christian mystics do too. So did alchemists, Sufis, fakirs etc. Failing to grasp this simple fact shows a lack of imagination, in my oh-so-humble opinion. Husserl profoundly probed the limits of what we can know and how we can know it. Just because there are things that are impossible to know, does not mean that they are not real. I am not going to do more than skate lightly over the surface of Husserl’s thinking. First, some background. Husserl was born in 1859 in Proßnitz, a town in the Margraviate of Moravia, which was then in the Austrian Empire, and which today is Prostějov in the Czech Republic. He was born into a Jewish family, the second of four children. His father was a milliner. His childhood was spent in Proßnitz, where he attended the secular elementary school. Then Husserl traveled to Vienna to study at the Realgymnasium, followed next by the Staatsgymnasium in Olomouc. Husserl then studied mathematics, physics, and astronomy at the University of Leipzig from 1876 to 1878. At Leipzig he was inspired by philosophy lectures given by Wilhelm Wundt, one of the founders of modern psychology. Then he moved to the Frederick William University of Berlin (the present-day Humboldt University of Berlin) in 1878 where he continued his study of mathematics under Leopold Kronecker and Karl Weierstrass. 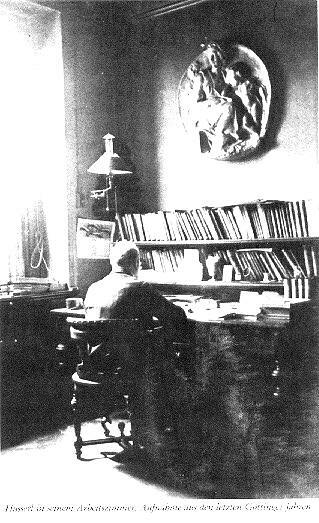 In Berlin he found a mentor in Thomas Masaryk, a former philosophy student of Franz Brentano and later the first president of Czechoslovakia. There Husserl also attended Friedrich Paulsen’s philosophy lectures. In 1881 he left for the University of Vienna to complete his mathematics studies under the supervision of Leo Königsberger (a former student of Weierstrass). He received his Ph.D. in 1883 with the work Beiträge zur Variationsrechnung (“Contributions to the calculus of variations”). As a result of his becoming familiar with the New Testament during his twenties, Husserl asked to be baptized into the Lutheran Church in 1886. 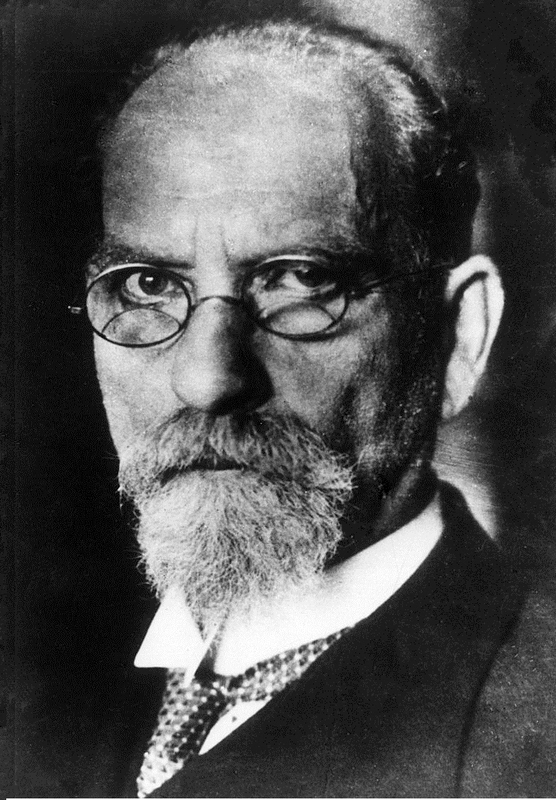 Herbert Spiegelberg writes, “While outward religious practice never entered his life any more than it did that of most academic scholars of the time, his mind remained open for the religious phenomenon as for any other genuine experience.” Although a steadfast proponent of a radical and rational autonomy in all things, Husserl could also speak “about his vocation and even about his mission under God’s will to find new ways for philosophy and science,” according to Spiegelberg. 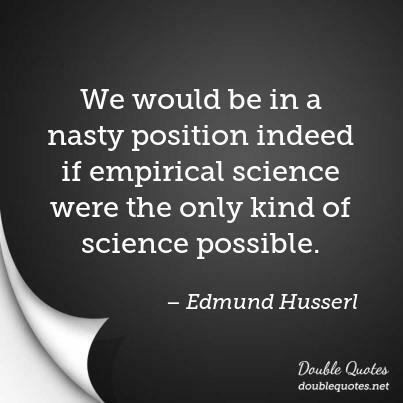 Following his Ph.D. in mathematics, Husserl returned to Berlin to work as the assistant to Karl Weierstrass, yet felt the desire to pursue philosophy. When Weierstrass became very ill, Husserl was freed to return to Vienna where, after serving a short military duty, he devoted his attention to philosophy. In 1884 at the University of Vienna he attended the lectures of Franz Brentano on philosophy and philosophical psychology. Brentano introduced him to the writings of Bernard Bolzano, Hermann Lotze, John Stuart Mill, and David Hume. Husserl was so impressed by Brentano that he decided to dedicate his life to philosophy. Two years later, in 1886, Husserl followed Carl Stumpf, a former student of Brentano, to the University of Halle, seeking to obtain his habilitation which would qualify him to teach at the university level. There, under Stumpf’s supervision, he wrote Über den Begriff der Zahl (On the Concept of Number) in 1887, which would serve later as the basis for his major work, Philosophie der Arithmetik (the Philosophy of Arithmetic) (1891). I’ll leave it at that. If you know any philosophy, chances are you know this stuff already, and if you don’t know it, chances are that you don’t care. I get fixated on these ways of thinking because my garbage mind wants to pull together disparate ways of thinking into one vision. Probably hubristic of me. If you want to view the world through one lens only, I wish you all the best. I don’t. When I see a star, I want to think of it in terms of physics, theology, art, philosophy, psychology, astrology etc. All these avenues teach me something, and they can all come together if we allow them to. It is conceivable to me that a grand synthesis of ideas is within our grasp, but we have to work in that direction. Why do you think I write this blog which combines everything under the sun? Česnečka is a well-known garlic soup from Husserl’s Moravia, now found widely throughout the region. It always involves heavy use of garlic in broth with potatoes, and can be spiced with caraway, marjoram or cumin. You can also add a local cheese, Olomoucké tvarůžky. It is a ripened soft cheese with very low fat content, pungent taste and strong odor. Dishes containing this cheese can usually be recognized by the word Loštické in their names, such as Loštická česnečka. You’ll need some breath mints afterwards. A mouth smelling of garlic soup and Moravian cheese will fell an ox. Melt the butter over medium heat in a heavy saucepan and add the potatoes. Stir the potatoes often and let them turn color slightly. Then add the onions and cook until translucent. Add the garlic and stir well, so that all the ingredients are mixed well. Add the broth, marjoram and bay leaves, and season with salt to taste. Bring to a simmer and cook until the potatoes are as soft as you like them. 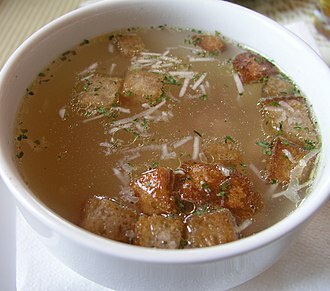 Serve in deep bowls with croutons on top, and some grated cheese if you prefer. Some cooks use an immersion blender on the soup before adding the croutons and cheese to make a smoother dish.